I have several speaking engagements and conference presentations coming up in the next few weeks. Please stop by and say hello if you can make it! 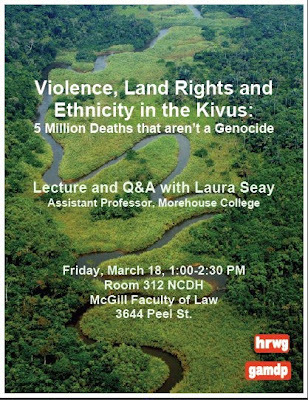 March 18, 1pm at the McGill University Faculty of Law - "Violence, Land Rights, and Ethnicity in the Kivus: Five Million Deaths that Aren't a Genocide"
March 18-19 in Montreal - Annual Meeting of the International Studies Association. I am on a round table on legitimacy and sovereignty on Friday morning and chair a panel on Somali piracy on Saturday afternoon. Kudos to Sienna Anstis & colleagues for the flier design (above), which is one of the coolest I've ever seen. April 1 in Chicago - Annual Meeting of the Midwest Political Science Association. I'm presenting on an 8am (!) panel with, among others, the amazing @dadakim. The papers are about public services in Africa; mine is on measurement problems in the study of public goods in fragile states. Hope to meet many of you soon! If you have a chance to sample the smoked meat sandwiches at Schwartz's, do so. The place is a Montreal institution and has been featured in National Geographic. For finer food, you can't go wrong with Au Pied de Cochon or L'Express. Both are a 10-minute cab ride from McGill University. Thanks, Marc! It's my first time in Montreal and I'm looking forward to the trip.